As a follow-up to the previous post, I’m also sure that the question is asked, “What about the ladies?” Well, women have been part of GI Joe since the 60’s. Okay, so she’s a nurse. Hey, it was the 60’s, give them credit for trying. When the 80’s came around, the Joes had a few women as combat troops. Not a lot, since most little boys don’t really want to play with a toy of an icky girl. Grown men who collect toys are a different story. We can’t get enough of female action figures. Which leads me to the modern version of the original female G.I. Joe. 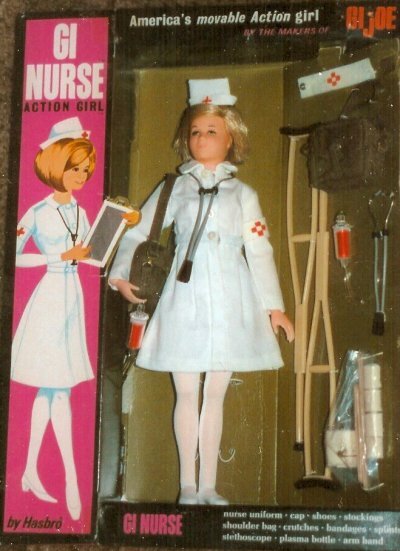 The modern story puts a spin on the old doll by saying that all those years spent as a combat nurse was actually a cover for her real mission as a scientific specialist for the team. This GI Jane was released along with GI Joe in an exclusive collector set in 2006. She’s also retired from the service and is now a scientist working alongside her old partner. For a scientist, she’s armed to the teeth. I guess old habits die hard. The figure’s proportions are much better than Joe’s, though she does have broad shoulders and some pretty large, uh…guns. The bottom of her legs are molded in one solid color, and the pants aren’t painted to match the thighs. Cost-cutting measure, or did they just not care? I’m just glad she looks better than Scarlet. All her toys are ugly! I beg to differ differ! I saw that Scarlet, and the picture you’re showing is taken at an angle so it hides her harsh features. That GI Jane looks like she could make GI Joe her b*tch!